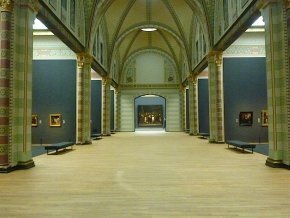 After closing for ten years, due to various delays in the renovation project, the Rijksmuseum (ill. 1) finally reopened its doors to the public on 13 April. Fortunately, it was well worth the wait. When first learning that Wilmotte was in charge of the museum changes, we were not exactly reassured by what might be the end result. This architect is indeed known for uneven performances, capable of giving his best but also his worst. For the Rijksmuseum, the scales are tipped in his favor though we cannot totally absolve him of at least one fault, his love of gray. While this color often enhances works, a systematic use (although with variations of bluish-gray and greenish-gray) throughout the building becomes tiresome after a while. Fortunately, the color of the walls can be changed and are not a permanent fixture. More importantly, the museography itself, here to stay, is in our opinion perfectly well done. However, the arrangement of the reception hall, installed in two interior courtyards under glass ceilings (the building architects, except for the museography, are Antonio Cruz and Antonio Ortiz), could have been more understated (ill. 2). 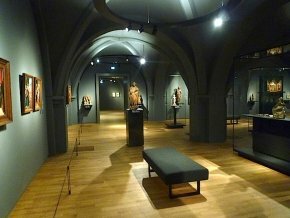 Unlike its former presentation and is the approach found in many important museums (foremost of which is the Louvre), there is no separation by technique, nor really by schools. Everything is mixed together here, with paintings hanging next to objects, sculptures facing arms or canons... Except for part of the first floor presenting the Golden Age masterpieces - which we will soon come to - the rooms are organized by theme. This hang, rather unusual in fact for a major fine arts museum, works well. The building, in the shape of a rectangle with the two long sides connected by a large central gallery, has left, after much debate, the ground floor free for a cycling lane which extends from one end to the other. This complicates the layout of the visit : after starting in the basement with the Middle Ages and the Renaissance, museum goers must continue on to the first floor if they wish to pursue a chronological line to the 17th century, then return to the ground floor for the 18th, go back up then down the other side of the cycling lane to reach the 19th century. The 20th and 21st centuries (two very small sections) are located on the top floor, on either end of the building. The visit begins in the basement very logically with the Middle Ages and the Renaissance (ill. 3). 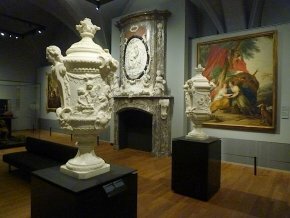 Besides the mix of sculptures, art objects and paintings, the schools are also presented without a visible separation although, as is the case in the rest of the museum, Dutch art of course dominates. The glass display cases are particularly light, as elsewhere in the museum. At certain angles, we found that the opposite side appeared to even disappear because the glass is so transparent. The artificial lighting is of fine quality, avoiding as much as possible any reflections on the paintings (though the general atmosphere is, as usual, a bit too dark) with very complete and informative signs (written in Dutch and English). The museum has also provided for the comfort of its visitors : seats are readily avalable to simply rest or to contemplate the works in optimum conditions. Obviously the collections on display are incredibly rich. It would be impossible to give readers even a superficial idea of the artistic wealth in this short article. We will simply illustrate our words here with some of the works which impressed us the most such as, in this section, a Virgin with Child by Vermeyen (ill. 4), a bust of Christ by Caccini (ill. 5) as well as a small alabaster altar (ill. 6). This gallery was entirely restored, the mural décor which over time had entirely disappeared uncovered and cleaned. The ensemble is particularly beautiful and is well worth the trip just to see it alone. On the sides, several small cabinet rooms (their size and layout recall those at the Louvre, before the Grand Louvre, which housed the Northern European works), still welcome paintings from the Dutch school (ill. 8) and we also find a few rooms with small sculptures (ill. 9). At the building corners, some thematic rooms highlight foreign schools (one of them notably presents court art in France). As on the other floors, there are rooms offering graphic arts, prints and drawings, with a rotating hang every three months. For the 17th century, we would point out two rooms in particular, one on the young Rembrandt which also presents paintings by Pieter Lastman and Jan Lievens, the other devoted to Mannerists and Caravaggists (ill. 10). 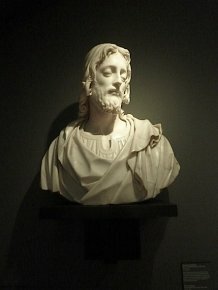 Visitors will discover notably a Christ with the Church Doctors by Orazio Borgianni which came up for auction at Sotheby’s in July 2012 and which we had reproduced here at the time. The museum had attempted, but failed, to buy it. Instead, it was acquired by a foundation which has placed it on long term deposit. This reopening also provides visitors the chance to see the many works acquired over the past few years since the Rijksmuseum remained particularly active in its acquisitions. Although the 17th century forms the core of the museum collections, the 18th and 19th centuries are also far from negligeable. Even more so than for the 17th century, the different techniques are mixed together in a very harmonious way (ill. 11 to 13). As for the Asian collections (not in our chronological field), they now have a new specially built pavilion (ill. 15). Despite this inauguration, the renovation work at the Rijksmuseum is not completely finished : notably the wing for temporary exhibitions which is to open in 2015 with a retrospective of late works by Rembrandt, and also the storage facilities which will be open to visitors, thus allowing them to admire the paintings and sculptures which could not be fitted into the permanent itinerary.